Cycling back on the right road !! Well if you had any doubts last night confirmed it. Cycling is well and truly back on the right road. At the Sports Personality of the Year Awards cycling was represented in three of the major categories. Team of the Year Award went to the British Olympic cycling team. The cycling team won 14 medals in Beijing this year-8 of those were GOLD! Cycling also claimed the Coach of the Year Award-David Brailsford who is British Cycling Director of Performance collected this award. The BIG ONE - The Sports Personality of the Year was won by Chris Hoy. The last (and only) time that this award was won by a cyclist was way back in 1965. In that year it was Tommy Simpson who was presented with the trophy. This year the British Cycling Team dominated the Olympic Games and the awards collected last night were justly won. The spin off of all this? Well cycling is now seen as cool! Helped by the so called credit crunch the sales of bikes has increased dramatically and that's not just mountain bikes. The sales of road bikes has increased as well and this must be as a direct result of the success of the British Cycling Team. Hopefully more youngsters will join their local cycling club and go on to follow in the slipstream of the great cyclists that collected the trophies last night. A Ferry- A Hill and A Puncture. On Wednesday 10th December I woke up full of anticipation as I had arranged to go on a training ride. The previous day John Donoghue had told me that he was planning on going on a bike ride on the wednesday morning. As I had not been out on a bike for a couple of weeks thanks to a bad cold I told him that I would meet him for the ride as well. Jason Boynton-Lee said that he would come also. The arrangement was that we would meet at the Sandbanks Ferry at 1030. RevPro Cycling Team WILL ride again!! Yes it is true! The RevPro Cycling Team will ride again during 2009. The plan is to catch the ferry to Cherbourg and then cycle down through France to the Pyrenees. We will then ride over one of the mountain passes crossing the Pyrenees into Spain. We then carry on along the coast to Bilbao or Santander where we will take another ferry to return to the UK at Plymouth. We will then return to Bournemouth along the south coast. In other words one great big circuit involving three countries. There will be one major change to the team next year. Gareth Morns is getting married next year and with all the planning that entails will not be riding with us on this trip. His place will be taken by Jason Boynton-Lee. All other team members will be the same as during this years LEJOG. The proposed date for this challenge will be during June. It is also possible that the teams name will change for 2009 but I will keep you posted on any developments about this. This trip known as the Atlantic Challenge Ride (ACR for short) will not be done for charity but just for our own enjoyment and amusement. The team have just six months to train for the ACR and you will be kept up to date on the progess being made. After we completed the LEJOG a lot of people said to me how much they would love to do a trip like that. Well now could be your chance! We have a space for one more person to join the team for the ACR. Basic requirements are an ability to cycle 100 miles a day over multiple days and a determination not to get off the bike when faced with huge hills. If you feel that you could train to achieve this, then leave a message and I will get back to you and you can come out with us on one of our training rides and see how you do. Ray Mears or just Peter Calcutt? The Saturday night of our pre Christmas static meet was cold. The temperature at one point dropped to zero. In the early hours we had sleet which covered the tents and as dawn approached the temperature started to rise causing the frozen sleet to slide from the tent walls and leave a neat little wall of ice all round the bottom of the tents. The sleet turned to rain and eventualy the rain washed the neat little ice walls away. It continued to rain until about 1030hrs when a blue sky started to appear allowing us to start to break camp. The weekend was enjoyed by all and the walk that John led was a good one which included farm tracks-trails through the woods and a superb ridge section that offered great wide vistas across North Dorset. It is a pity that more members do not bother to attend the late Autumn and Winter meets as they are such a contrast with our last static that was held at Tom's Field. It is obvious that a camp site on a really bright warm and sunny weekend at the end of summer is going to be busy with more people and more tents and more camp traffic all of these things creating more noise and less space. Out of season it is a completly different story and in many cases such as this weekend we are the only campers in the farm field. I have posted a selection of photos from this weekend. these include shots of some of the happy group in their tents-lunch in the woods-Graham demonstrating how he packs his Jam 2 sac and a shot of Peter doing his Ray Mears impression in his temporary shelter !! I managed to cycle back without any rain and with bright sunshine although the gusts of wind were a bit scary on the bike. More from the pre Christmas meet. This weekend some of the Dorset Backpackers group have met up for a static weekend. The location is the village of Sixpenny Handley in the north of the county. 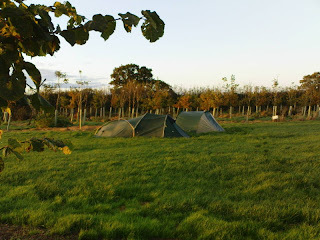 We arrived on the friday with six tents being set up and occupied by 7 hardy souls. I cycled over here on my revolution tourer and Chris and Mike had cycled here on their giant expedition bikes. The others all arrived by car. We are staying at church farm where there are no screaming kids and plenty of space as we are the only ones here. John arrived fully prepared with a pre planned route for todays walk which was good as those that know me will know that i dont do pre planned. This always slightly worries john hence the prepared route. Everyone enjoyed the walk today and now we are all back in our tents before heading off to the village pub for beer and food. An arctic blast is supposed to be heading our way so maybe we will have a colder night than the mild one we enjoyed last night. Just a reminder to everyone that the charity website www.justgiving.com/revproteamride will close this Sunday 9th November 2008. Our original fundraising target was £2500.00 which we achieved five minutes before the RevPro team set out from Lands End. Since then donations have continued to come in and the figure raised now stands at £5079.50. When we decided a year ago to ride from Lands End to John O' Groats we felt that we would struggle to reach £2500. To have managed to double this figure is more than we could ever have hoped for. The RevPro Cycling Team would like to thank everyone who has supported us and made a donation to the Dorset Kidney Fund. Peter and I are now on the way home from our stay in the Mendips. We are camping on a farm at West Stour west of Shaftesbury . Todays weather was dry till just after we put up the tents and then the rain came down . Very cold tonight with ice forming on the inside of the fly sheet. This has to be one of the grandest fronts to any cathedral in the UK- I love it! The past few days we have been camped at a site near Priddy. I have not been able to send updates to the Blog due to a poor signal. 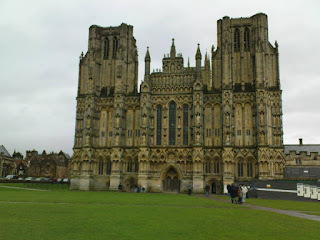 Yesterday we did a circular walk to Cheddar Gorge and today we have walked in to Wells to look at the Cathedral. Weather has been very mixed. Photo shows a lunch stop during our ride up here. It was too much to have hoped for. Another day off and what turned out to be another summer like day. As I said in my last posting, these indian summer days cannot afford to be wasted so today I set out on another cycle ride with JB-L. From Brockenhurst out to Ringwood and then to Fordingbridge. From there we carried on to Cranborne where we stopped for Coffee and Cakes (well we had earned it) before we headed back to Bournemouth by way of Wimborne. A great day cycling with really good weather. It is probably too much to expect good weather for my weeks cycle touring with Peter Calcutt starting next Wednesday- still you never know! Two weeks ago we had good weather for our Backpacker Club static weekend and as we aproached this weekend the weather forecast was good again. After the poor summer that we have had it seems more important than ever to take advantage of any good weather that seems to come our way. Not having purchased an 'Elliptigo' the first thing that I had to do was make the choice of Walk Run or Cycle. It was easy to eliminate going for a run as I don't do running! It has never really appealed to me. All that thumping along the pavement while you get covered in perspiration - no not for me and anyway most of the people that I see out for a run don't look as if they are enjoying it all that much. Now walking that's more my thing. It seems a more fluid movement than running and most of those that I meet out walking whether its Hill walking -Trekking-Backpacking -a Walk in the Country or even a walk to the corner shop all seem to be enjoying themselves. However I really wanted to cover some mileage this weekend and see as much of the autumn countryside as I could, so when Jason Boynton-Lee phoned me up on Friday night and said 'Red sky at night shepherds delight- do you fancy going for a cycle ride on saturday' my decision was made. At 1000hrs this morning Jason and I headed off on our bikes. Getting out of the Bournemouth area was as always the usual struggle with cars starting and stopping and generally clogging up all the roads. After about 10 miles we got through Wimborne and out on the B3078 towards Cranborne then left on the B3081 passing through Sixpenny Handley and Tollard Royal down the zig zag hill and into Shaftesbury. 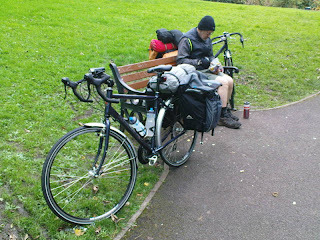 We had coffee and cakes with the bikes taking a rest leaning against a nearby wall (see picture). After our well earned break we set off on our return journey with a very stiff climb up to Melbury Down. The views were superb with dry roads and a few crisp freshly fallen leaves finding their way under our tyres as we zipped along the ridge line. The run back was great passing through all the Tarrants- Gunville- Monkton-Rawston and Rushton. Just before Tarrant Keyneston we took a left on to the B3082 passing Badbury Rings before heading into Wimborne and the return to Bournemouth. It was a superb ride with perfect weather and going through some wonderful countryside. One of those rides that you remember. Details of the ride:- 68.43 miles - 4.39 hours actual cycling time - 15.58 mph average speed - 35.2 top speed - calories burned 4113. The Bug is catching ! I have just heard that Peter Calcutt one of the Backpackers Club Dorset Group members has taken delivery of a brand new Revolution Country Traveller touring bike. Peter and I have often been on backpacking trips to the high and wild places together so I know how much he enjoys getting close to the elements which sometimes has included getting totally soaked to the skin such as on our last trip to the Black Mountains. Apparently after reading about the LEJOG trip on this blog Peter feels that he doesn't want to miss out on yet another way to give himself more pain and the chance to get even wetter than that Black Mountains trip, hence the new bike. Peter and I have a combination walking/cycling trip planned to start in two weeks time so I will keep you informed of how he gets on with his new purchase. If you can't decide to go for a walk,a run or a cycle ride you can now do them all at the same time. Here's a link that came to me via the Cyclists Touring Club. It is well worth checking out. Make a special point of looking at the video it might save you that difficult decision. Let me know when you have placed your order!! Looking back at LEJOG- A review of our ride. Between us we took a lot of pictures but I can only show a few to give you a flavour of the ride. 1)Bikes on the Severn Bridge. 2)Bikes in the room at the Premier Inn. 3)A rare sunny moment before the rain. 4)At Shap with Alyson van Raalte. 5)Dave doing a minor repair to one of the bikes. I think that I can speak for the rest of the team and say that none of us would have missed this trip for the world. I know that it is a cliche, but some trips can change your life or at least your view of it. This LEJOG trip has had a profound effect on each one of us. None of us will ever forget it! We worked really well as a team in order to ensure that each one of us made it to the end. The support that was given to us from the most unexpected quarters was overwhelming as was the sense of total disappointment at the lack of support from areas where we had every reason to expect it!! The ride has taught us as much about other people as it has about ourselves. People who we met along the route- people who did not know us -took an interest in our ride and contributed to the Dorset Kidney Fund. What does that say about the kind of people they were? People such as Alyson van Raalte(shown in picture 4 above) who we met at Shap and Suki Sangha the owner of the Indian restaurant in Dunoon where we had a meal. The ride was tough and not helped by the run of bad weather that seemed to follow us up the country. Due to the bad weather we only managed to camp out on four nights. But the need to dry out properly after 100 mile days meant that we also mixed in Hotels, B &Bs and even a Self catering Farm House. The bikes were the real stars not giving us any major problems over the entire ride. John had three punctures in one day and this led to a complete change of tyres. Johns original tyres were replaced with Shawalbe Marathons with puncture protection. Gareth and I were using Continental Sport Contact tyres and these gave us no problems at all. 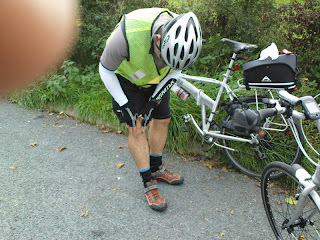 One of my pedal cages fell off a few miles after leaving Shap but the Superstar of the trip Dave Vaughan fitted it back on in no time at all (picture 5 above). Every LEJOG cycle trip should have their very own Dave! Dave was the mechanic. Dave was the Domestique. Dave was Broom Wagon driver. Dave was Logistics manager. All we had to do was spin pedals but Dave seemed to do everything else. Dave was in every sense of the word a Super Superstar. Thanks for everything Dave. During the ride we each burned in excess of 55,000 calories over the 978 miles that we covered. We consumed between us over 75 malt loaves. 125 energy bars. 3 tubs of energy drink powder and gallons of water. Our average speed over the entire ride was 13.14 mph and the time spent spinning the pedals was just over 74 hours. Would we do it again ? Well probably not LEJOG. Once done it becomes yet another adventure to tick off. However we had only been in the vehicle for about two hours on the return trip when talk came around to "What shall we do next"? I will let you all know when the next cycling challenge is set! ASDA at CASTLE POINT BOURNEMOUTH for supplying our special nutrition requirements. COOPERS cycle shop in SHREWSBURY for sorting out John's tyres and inner tubes and getting him back on the road in double quick time. THE BOMBAY INDIAN RESTAURANT- DUNOON- The owner/manager Mr Suki Sangha is a true gentleman. The BIGGEST thanks of all must go to EVERY SINGLE ONE OF YOU who have supported us and donated to the DORSET KIDNEY FUND. The great thing about the Backpackers Club static weekends is the social element. By definition most Backpackers do most of their trips solo, so it is great to get together to exchange ideas about gear and routes etc. Meeting other people with a similar interest is another bonus of these weekends. One of the people that Peter Calcutt and I met on the Monday morning at Tom's Field was a chap by the name of Garyhat Lakritz. Garyhat is planning an around Britain charity walk of 6ooo+ miles setting out in February next year. He is doing this as a charity walk in aid of the Histiocytosis Research Trust. A pleasure to meet you Garyhat. Last night was much quieter than the previous night and this morning no mist to shroud the site in an early gloom. Alan had a call from home first thing informing him his Dad was unwell so he had to return home. Don set off early on his own walk and the rest of us set out about an hour later. We walked to Corfe and then up to the ridge overlooking the castle where we had a picnic lunch. We then carried on along the ridge and then back down into the valley and up the other side to return to the site. After mugs of tea followed by icecream most club members headed back home. Four of us are staying another night. For us the site has now reverted to an almost empty field- peace and quiet now reign. As the Buddha said. . .'Do not desire peace and peace will surround you.' 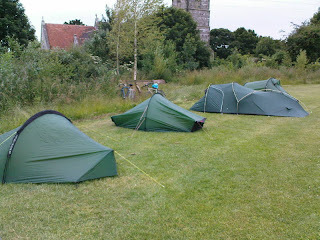 The picture shows the site this evening with our tents and one or two others. PEACE! Dorset Backpackers static weekend meet. After a noisy night on the campsite - courtesy of a group of young climbers- we woke up to a misty morning with no sun visible. I told everyone it would burn off by 1030 and it did. 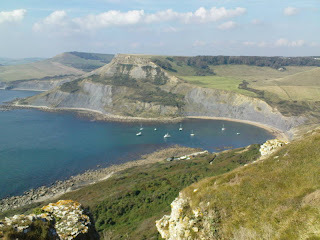 We headed out on a circular walk taking in Dancing Ledge, Seacome cliff, St Aldhelms Head, Chapmans Pool and into Worth Matravers where we headed for the tea shop for various tasty items such as Dorset Apple Cake with clotted cream. We then walked back to the site by way of the Priests Way. After a doze followed by a camp meal it was another evening spent at the local hostelry. 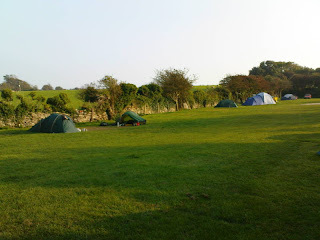 Tonight the climbers have gone and there is a hush over the site with just the sound of snoring from one or two tents. 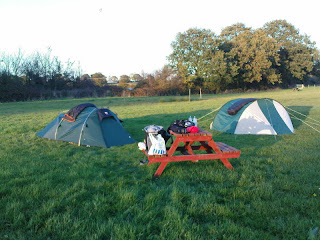 Dorset Backpackers static weekend camp. After finishing LEJOG a week ago today and having 4 days back at work I thought it was time i had a bit of a ride. The picture shows my Revolution tourer with panniers on arrival at Toms Field camp site for this weekends club static meet. Not a great distance as its only 22 miles from home but great to be out on a bike again? This picture is a view of the small harbour at John O' Groats taken just a few minutes before we set off on the long drive home on the morning of September 20th 2008. A review of our LEJOG ride including some interesting facts and figures will appear shortly. This morning Dave dropped me back at Tore. My challenge today was to try and catch the rest of the team before John O Groats. I was 18 miles behind. John And Gareth were going to start out a little later to give me a chance of the catch up. The day looked as if it could be dry, we all deserve that at least. I stood there on my own and tried to focus on the task ahead. I climbed on the bike and started to spin the pedals. I still didn't feel 100% but I did feel a lot better than yesterday.I set out on the A9 and the first road sign told me that John O Groat's was 114 miles. well. Dave confirmed what I knew. I was gaining on the others. I was only 25 minutes behind them.I asked how they were doing and Dave told me that they were also doing well and in fine spirits. 3 minutes later and back on the bike I was off again. I was going well today. Everything seemed to be coming together. Next stop 10miles along the road and as ever there was Dave. "Your doing really well" he tells me "You are now only 15 minutes behind them." Yesterdays terrible day was going to be worth it after all. Back on the bike and away I went. The broom wagon swept pass me and out of sight. I glanced down at the Garmin, it was telling me that I was doing 23.4mph along the flat and the legs felt good. I can't remember where it was, but I rounded a bend to be faced with the scene in the first picture. It took a minute or two to take it all in. "What's happened"? I said fearing the worst. "Everything is OK" was Dave's reply. Apparently an impatient Truck driver had tried to overtake Gareth and John on the bend. When he realised traffic was coming towards him he had swung back in towards the kerb and had knocked John off his bike. John landed on the pavement sprawled on the ground very very badly shaken but thankfully not hurt. It is thought that the lorry was from a local company based at Wick so he should know the road well. Traffic on the other side of the road had been forced to a halt. The Lorry DID NOT STOP !! There is no way that he would not have seen John as John was wearing a post office high viz top as you can see. The policeman reckoned that you could see John from a mile away. After all the bad weather that we have travelled through this happened on a dry day with good visibility. All details were recorded by the Police and he radioed ahead to have the lorry stopped. At this stage I don't know the outcome of this. Before we set off on our way the policeman reminded us of two massive climbs we had still to come. Helmsdale - climbing from sea level to Ord Point at 750 ft and then a bit further on Berriedale - climbing from sea level to 560 ft. Berriedale is actually worse as it achieves it's height in a shorter distance by the use of hairpin bends. At least the team were now all back together. We all powered on - all riding well considering that we had travelled the distance we had. Yes, the two climbs were every bit as bad as we had been told that they would be, probably the worst of the whole trip. Even Perranporth in the west country was as nothing compared to these brutes. But once done they were done and we cycled on. We had calculated that we would not arrive at John O Groats until about 1930. As the rest of the day wore on we were all feeling the effects of 10 full days in the saddle. By the time we arrived at Wick we were all but done in. John had said earlier in the trip that the closer we got to the end the easier it must become. I had not dared tell him that this is very rarely the case and that it can become more difficult. About 3 miles past Wick the road takes a sharp right. The sign said JOHN O GROATS 13 MILES. For each one of us this was to become the very longest 13 miles that we had done. The road went on in a never ending kind of way. 13 miles should be done in less than an hour we had thought.We pushed on always expecting a downhill gradient that never came. This had been a huge day for each one of us. We were all riding on empty.You could tell now how difficult this had become for John who up to this event was really a non cyclist. Three pedals spins and then he would try and coast along, but you can't coast up hill. This was the sting in the tail about the last 3 miles it was uphill! How cruel can this ride be? Even the last three miles is going to be tough. "Come on John you can do it" "Keep on pedalling" Three pedal spins coast- three pedal spins coast and then just over a rise there was the ever present Dave parked at the side of the road. "You are almost there" he said. And the last few hundred yards was actually downhill -we all sailed passed the John O Groats sign together with Dave in the support vehicle rolling in just behind us. We have done it. 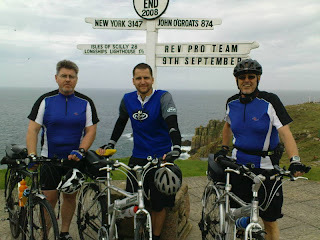 We have all cycled from Lands End to John O Groats. We have done it for the Dorset Kidney Fund. It had been an adventure that not one of us would have missed. Tonight a nice meal - a few drinks - followed by a comfortable bed and some rest and perhaps a little pat on the back for each other at beating the challenge !! Todays Mileage 115 (Gareth and John 97) Average speed 12.3 mph - Top speed 40 mph - Calories burned 6211. IF YOU ARE ONE OF THOSE PEOPLE WHO TOLD US THAT YOU WOULD SUPPORT US ON LINE WITH A DONATION AND YOU STILL HAVEN'T DONE SO,NOW IS YOUR CHANCE.WE KEPT OUR END OF THE DEAL ,TOUGH AS IT WAS,NOW YOU NEED TO DO YOUR BIT, JUST PUT YOUR HAND IN YOUR POCKET.IT'S EASIER THAN CYCLING FROM LAND'S END TO JOHN O GROAT'S !! APOLOGIES !! DUE TO A TECHNICAL FAULT WE WERE UNABLE TO PUBLISH BLOG FOR TWO DAYS - HOWEVER AS THEY SAY IN THE MOVIE BUSINESS "THERE IS NOTHING SO GOOD AS A CLIFF HANGER TO HOLD PEOPLES ATTENTION". The reason I was so exhausted yesterday was due to the fact that I had picked up a stomach bug. I had little energy and it seemed to get worse throughout the day- far more than the normal tiredness that I would expect from cycling the distances we have been. Last night I could not eat my meal and had to take to my bed early. The others looked worried! This morning I was so weak that I could not get out of bed. At 0815 John and Gareth were ready to set off and I was still in bed looking and feeling like death. The decision was made that they would go on ahead and if and when I was able to get on my bike I would try and follow behind. Poor Dave was going to have his work cut out trying to support a team that was now split in two. I crawled on to my bike at 0916 and set off. Guess what, it was raining again! I knew I was ill but could not understand why. Maybe all the doom mongers were right-maybe at sixty I was to old for this sort of thing-Maybe I should stop now, the easiest thing today would be to stop and get into the broom wagon. At the first stop just before Fort William I tried to drink and I couldn't I tried to force down an energy bar and I couldn't do that either. I had not eaten anything for over 24 hours and I was very aware that without food and drink I was not going to achieve the distance today. One thing that I did want was a toilet. Dave said he would go on ahead and find one. He shot off and I carried on trying to pedal my bike. There I was feeling ill, trying to ride a bike 100 miles a day in the pouring rain and wanting to go to the toilet real bad. My stomach had swollen up, the others were now well over an hour ahead and I was struggling to make 9/10 miles an hour. I must be BL**DY mad. Anne's been right all these years after all !! Then I saw Dave ahead. "the toilet is over there" he said. I fell off my bike and crossed the road to the Loo. In the toilet I soon found out what the problem was. A major stomach bug of some kind. Serious diarrhoea. I had a problem. Back out of the loo on to the bike and I asked Dave how John and Gareth were doing. "Going like a train" was Dave's reply. Dave did say to me that I might have to consider the possibility of stopping. My plan was to keep on going as best I could and see where I ended up at the end of the day. My biggest worry was that I was using energy but was not replacing it as I could not take in anything. I dont remember much about the day but the things that I do remember were - The rain- The pain- stoppping at more Loos along the way (not even locking the bike up, just diving in and leaving the bike with Garmin sat nav etc all there for anyone to help themselves to) and a feeling of complete loneliness out on the road even though Dave was meeting up with me every ten miles. The others were doing well. John (with one kidney) had exceeded his best hopes for this ride-Both Gareth and John had displayed a grit and determination that is rare.It looked like they were going to nail this challenge and I wanted to be there at the end too. By dark I was at the village of Tore north of Inverness. Dave came and picked me up and took me on to the bunkhouse at Balintraid near Invergordon. The plan is that he drops me back at Tore tomorrow morning and I continue to play catch up. I feel slightly better this evening. Todays report will be short as I am totally exhausted! When we set out the ride felt like a tour and not a race the first time it has felt like this since day 1. However the day seemed to be mainly uphill - there were sections that were uphill for 6 to 7 miles at an elevation of 4- 7 per cent. Places we went through today were Strachur-Cairndow-Tarbet - Crianlarich - Tyndrum - Bridge of Orchy - across Rannmch Moor - down through Glen Coe to our nights stop at Balluchulish. The road surface was very bad shaking us badly. Mileage 100 - average speed 12.4 - top speed 29.8 - calories burned 5675. 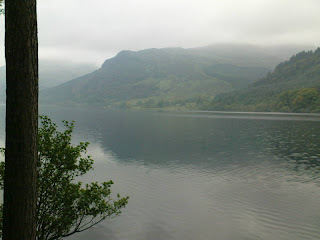 The picture is a view of Loch Fyne at about the 12 mile point. Our worst fears were well founded. Todays conditions were more atrocious than yesterday! More rain but heavier. More lorries but bigger. More muck more of it. More pain More pain and even more pain! Today it got to the point where we were unable to change gears because our hands were so wet and cold. Today rates as the worst conditions for cycling that I have ever known. We arrived at the ferry at Gourock for the crossing over to Dunoon with 10 minutes to spare. In those 10 minutes our bodies seemed to shut down due to the exertion and the cold and wet. We decided at that point that on landing at Dunoon we would book in at a Guest house and have an early finish. Common sense prevailed- this now means that due to the bad weather it is likely that we will arrive at JOG 24 hours late ie Friday. We have very comfortable rooms for the night which is great for our recovery and this evening we went into town for a curry to warm us up.We were made most welcome at the Bombay Indian Restaurant in Dunoon by Mr Suki Sangha who was the perfect host. At the end of the evening he handed us an envelope containing 40 pounds for our charity fund. What generosity from someone who had only met us a couple of hours earlier- a true gentleman!! Oh and the food was top notch too. Mileage today 65 miles of very hard earned mile munching - Average speed 13.9 mph - Top speed 34.5 ori- Calories burned 3676 . We dare not listen to the weather forecast ! ! 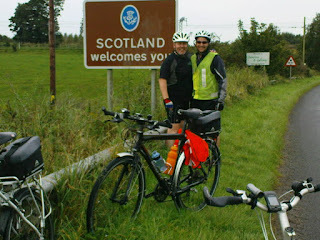 Todays picture shows Gareth and John at the border to Scotland. We crossed over at Gretna Green. The day was wet - wet - wet . All day it rained from the time we left Shap to the time we arrived here about 20 miles south of Kilmarnock. The day was horrendous with huge trucks thundering past us and chucking out gallons of spray and dirt. We were soaked to the skin and filthy with road grime. It probably rates as one of the worst days any of us have ever had at any time. However we havent lost sight of the reason we are all doing this ride- that is what is driving us all on. We are staying in a farmhouse annexe tonight with all mod cons as we really needed to dry everything out- including ourselves! We saw the weather forecast tonight and it looks like we could have to suffer today all over again- the hell of the long distance cyclist!! Todays mileage 103 - average speed 14.6 mph ( for the first 75 miles we set an average speed of 15.00 mph which in todays conditions was some achievement ) Top speed 34.7 - calories burned 6426 . Tomorrow could be GROUNDHOG DAY! A good day on the road. As predicted we clawed back most of distance lost yesterday. We are just a few miles short of Preston. John had 3 punctures today and special thanks goes to Coopers of Shrewsbury for supplying new Tyres and inner tubes and giving Johns bike the once over to get him back on the road. 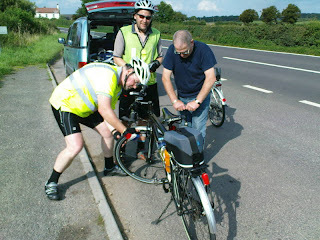 The picture shows some of the team doing roadside repairs. Good weather today. Mileage 106 - average speed 15.09 mph - top speed 35 mph - calories burned 6216 . Spirits of entire team are very high. Tomorrow we try and do it all over again! Last night was a wet and windy night the worst kind of night for camping- none of us got much sleep. Today weather was great till 2 hours before end of ride when the heavens opened on us. Dave and Mark two work colleagues came up from Bournemouth and met us on the road and then tonight we all went for a meal together- that was just the greatest morale boost - thanks guys! Todays figures- mileage 91 miles - average speed 14 mph - top speed attained 42.1 mph - calories burned 5743 - we are still on route target! We have now reached Okehampton as planned. A very tough day as we thought it would be- not helped by massive hills and rain at the end for last hour. Spirits still very high and team is working well together. Todays figures are- mileage 80 - average speed 12.9 mph - top speed attained 46 mph we burned about 4666 calories. It was the right idea to do part of the first stage yesterday- we would not have made it to here otherwise. 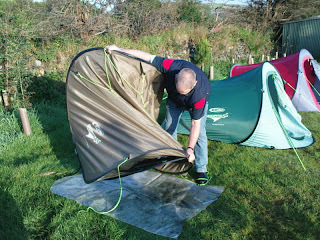 Picture shows Dave struggling to pack up a tent. A good first day- distance covered 50 miles- average speed 11.5 mph top speed attained 41.8 mph . We are now camping at St AGNES. We had no rain whilst riding today. We are all in good spirits even though some of the hills today were total killers. We heard just as we started today that we had broken through are fundraising target-great news and it gave us all a big boost to start the ride. Tomorrow morning we travel down to Land's End. Assuming we get there at around midday we hope to set off at about 1300hrs and cover the 40 miles to St Agnes. We feel that by doing this it will break us in to the ride in easy stages and give us a shorter day on Wednesday. The Devon and Cornwall stage is known to be hard so hopefully this plan will make it a little easier. On the weather front the forecast is not brilliant but bad weather is something that you just have to deal with. I have had my fair share of bad weather whilst backpacking and in a funny kind of way it can make the event a bit more of an adventure. When Gareth and I had our training day on the Isle of Wight we had a day of torrential rain plus a crash and a puncture so we know what to expect. Our fundraising has been going really well with about £400 being raised over the weekend.We are now less than £100 short of our target figure with more donations still to come in. Everyone has been great with their support and the DORSET KIDNEY FUND and the REV PRO LEJOG TEAM would like to say thanks for the support you have shown. We will give this our very best and I will be posting to this blog each night with details of our progress. If I cannot get mobile phone service in the evening I will make the posting at the next opportunity. Well- here we go !! As we approach the last weekend before we set off on the ride I see that our fundraising efforts have now broken the £2000 mark. This leaves us with just under £500 to go in order to meet the target that I set us when we planned the ride over nine months ago. All the team are hoping that over the next few days we have a last minute flurry of donations that takes us up to the £2500 figure. It would be great if when we set off from Land's End next week our target had already been achieved. Please help us get there by going to www.justgiving.com/revproteamride and making a donation online. John Donoghue informed me today that he has managed to arrange sponsorship from the ASDA branch at Castle Point in Bournemouth for our LEJOG. ASDA have agreed to supply our nutrition requirements for the entire ride. Items such as Energy Bars - Carbo Gels - Malt Loaves etc will all be supplied by them, which will be a tremendous boost for the team. A big thankyou must go to Nikki at ASDA for her help in organising this for us. It's great for all in the team that these nutrition requirements are being supplied for us, as it could make all the difference with our long term endurance and recovery each day. Thanks for the support ASDA !! Yesterday the LEJOG cycling team had their last group training session before they start cycling away from Lands End in one weeks time. We set off from Totton at 0650hrs and cycled back to Bournemouth via Lyndhurst and the New Forest. All the way we were dodging the rain clouds and luck must have been on our side as we did not get wet. Gareth used his Scott CR1 and I used my Felt Z80 for this ride. John used the bike that he will be using on the End to End - a Scott Sub 20 with 700c wheels. For those of you interested in the facts and figures John's bike has 27 speed Shimano Deore gearing- 48/36/26T chainrings with 175mm cranks. At the rear the Sub 20 has a Shimano HG50 9x 11-32T cassette. All this gives John too much choice in the gears department as it is the one area that gives him a few problems. Still, by the time he has got to John O'Groats I am sure he will have sorted it all out. All the bikes have been to the local bike shop for last minute checks and adjustments which included new chains-brake blocks and lubrication. For the next week I will NOT be riding my Lejog bike and my solo training will consist of between 10 to 20 miles each day (weather permitting) on either the Felt or my Revolution. The reason for this is because the Dahon is all prepared and ready to go and I won't have any spare time available between now and the off to spend cleaning it up if I get caught out in the rain. Obviously on LEJOG we would be very lucky not to get any rain at all but I do at least want to leave Land's End with a clean and well prepared machine. 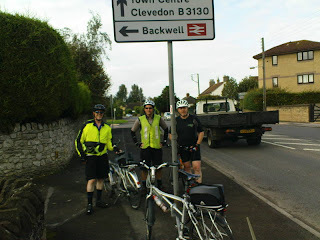 The picture shows the three of us at Bournemouth Railway Station after we had finished our ride yesterday. On the fund raising front we are only about £600 short of our target. It would be really great if we could reach the £2500 before we set off. If you would like to assist us in achieving this target figure please go to www.justgiving.com/revproteamride and thanks to everyone for your help so far. JOHN- A radio star ! Yesterday morning our very own John Donoghue appeared on the Julian Clegg radio breakfast show at Radio Solent. John was quite the star. He told Julian all about his career in the film industry and some of the major films that he had worked on and then went on to explain the effect his daughter getting the disease Lupus had on him. He told how it had made him re-evaluate his life and how he had given his daughter one of his own kidneys in order to save her life. Julian then asked him about his fund raising efforts for the Dorset Kidney Fund and all about our LEJOG. Julian gave out our fund raising internet page address : www.justgiving.com/revproteamride and they discussed the route we would be taking and the number of days that we expected to be in the saddle and pedalspinning. When we do the ride, Julian Clegg will be keeping in touch with us on his breakfast show. This will probably mean a live broadcast first thing in the morning by telephone every other day throughout the ride. I have been lucky in my life. No one that I have been close to has suffered an illness as major as John's daughter and I think that for the majority of us that is the case. However for those of us who are unlucky enough to suffer with something like renal failure, an organisation such as The Dorset Kidney Fund is literally a life saver. If you have yet to support us with a donation please don't put it off any longer. Just click on the link shown above and make your donation now! It is quick-secure and the fund also gets the money immediately with the added bonus of gift aid if you are a UK taxpayer. John Donoghue is the one person in the LEJOG team who is not a regular cyclist. John took up cycling about ten months ago, buying his bike and all the equipment needed just to do this ride. On top of this John has only got one kidney and I am sure that he won't mind me saying ,that due to all the functions that he attends he is carrying a little too much weight. But none of this has been viewed by him as too much of an obstacle. John is determined to complete this ride because it is raising money for something that he believes in- something that has had a great effect on his family. The rest of the team will be there to help him achieve it, please show your support as well. Why Does a Day at Work equal Good Weather ? This week John Donoghue one of our LEJOG team members has been invited to chat about our charity ride on the Julian Clegg show. This is a breakfast show on Radio Solent. With luck you should be able to listen to John on Monday 25th August at 0715hrs. We hope that with this kind of media help we will be able to give a boost to our fund raising efforts. At the time of writing this posting we are just shy of the half way mark for our fund raising target. Thanks to everyone who has made a donation so far and helped us to get to this point. If you would like to make a donation and are uncertain how to go about it- just go to www.justgiving.com/revproteamride where you will be able to make a secure donation on line. Three team members that we have not said too much about are the BIKES. John Donoghue will be riding a SCOTT SUB 20. John bought this bike in order to do this ride and on top of the £600 spent on it's purchase he has also spent even more on some minor modifications which include: Full SKS Thermoplastic mudguards - Brooks B17 saddle - upgraded pedals etc etc. At the last tally John must have spent over £1000 on the Bike and additional equipment and kit. The only thing on these bikes that is the same as the ones that you can buy in the shops is the Fullsize Folding Frame and the Gear Train. Almost every other part of these bikes has been customised-Fully upgraded brakes - Special extra strong but light weight wheels fitted with Continental Sport Contact slick tyres - upgraded pedals - special hand grips and bar ends - Full SKS Thermoplastic mudguards on my machine and Sports Guards on Gareths. Both Gareth and I are also sporting 'Brooks Team Professional' saddles on our bikes. The latest news on the breaking in of these saddles is that we are almost there. The saddles have now adopted the odd looking shape of our individual posteriors and although still hard are very comfortable. John has used about a third of a tin of Brooks Proofide in his attempt to make his B17 comfortable and his saddle is now all but broken in. Less than three weeks to go now before the off !! A number of people have been asking what route the team intend taking when we attempt our LEJOG in September. I have listed the main towns that we will finish close to each day. Depending on weather-possible breakdowns (that's on the bikes, not the riders hopefully) fitness etc we might finish each day either slightly short or maybe even just beyond each of the places shown. We will be travelling down to Land's End on Tuesday 9th September and if we arrive early enough we might well start by doing the first 40miles that afternoon. That would take us to St Agnes and by doing this we will be able to break ourselves into the routine more gently. It would mean that the first stage, which is accepted as being one of the toughest days, would be a bit easier to complete. In my last blog posting I told you about a chest infection that I had picked up. Since then the situation got worse. I arrived at work one day and found that I was having great difficulty in breathing. I went straight to the Doctor and was told that it would be better NOT to ride the bike in to work-take some time off-and I was prescribed some Antibiotics to help with the infection. The result was that I was off work for 4 days and so far I have not ridden a bike for almost 2 weeks. The infection is now clearing up and it is my intention to start riding again this coming weekend. This break in riding is the longest that I have not been on a bike this year. With that sort of lay-off I reckon that I will need to put the stabilisers back on !!! For those of you who have given us your support and made a donation ,thankyou very much both for the donation and your belief in our ability to complete the distance-we are certainly going to give it everything we've got as we have done during training. For those of you yet to show your financial support, may I remind you of our Charity webpage where you will find details of the charity we are doing this for and where you can make your donation online. LEJOG-Training grinds to a halt !! It had to happen. Just five weeks to go before we head NORTH out of Land's End and my training and fitness level is about to head SOUTH. Ever since I had to cut my Dorset Boundary Ride short due to the death of my Father I have noticed a worsening cough. Well today I have had it confirmed that I have a severe chest infection and for the next two weeks at least the wise advice is that I put a hold on the training. Cycling to work is OK but the twenty mile dash is off the agenda. This could not come at a worse time as the plan was that I would be increasing the distance throughout August.This would then bring me up to the level of fitness I need to tackle the 100 miles a day I will be doing on the LEJOG itself. There does not seem to be anything that I can do about this. If I ignore the advice I could make the infection worse and risk not being able to even start the ride. So it seems that for the next couple of weeks my training will consist of pottering to work on my bike and watching old videos of the Tour De France !! As far as I can tell ,the other guys doing the ride are all still training well and on their planned schedules. The picture above shows the three different saddles that I have had on the bike in my quest for a comfortable ride. The one on the left is the saddle supplied with the bike. It became obvious to me within the first few days of taking delivery of the bike that the saddle and I had to part company. It was the most uncomfortable object that I have ever sat on! 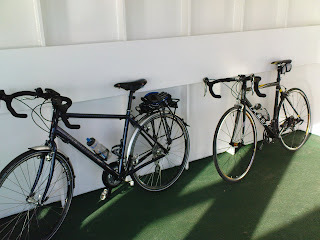 The saddle on the right was the next one that I tried and for most trips up to about 50 miles it was fine. Over that distance it did not seem to offer the support that I needed. Now, the saddle in the middle is my Brooks Team Professional. The Brooks might look hard (and it is) but the more I use it the more comfortable it becomes. The great thing about a leather saddle is that IT shapes around your rear end so it becomes personal to you. The huge copper rivets of the Team Pro and the hard leather might put a lot of people off trying it, but believe me it IS comfortable. A few years ago I did (with some others) the 24 hour Three Peaks Challenge to raise money for a local childrens charity. The hardest thing about that event was not the broken finger I got when I slipped over half way up Scafell Pike or the freezing conditions we found on the summit of both Snowden and Scafell. No, the hardest thing was trying to part people from their hard earned cash and get them to give it to others less fortunate. It was so difficult that I vowed that I would never do another charity event again!! Well here I am again and yes it is every bit as difficult as I remembered it to be. This time we have made it easier for people to show their support with a SECURE charity web page that they can go to and make a donation. Some people have been really generous with very large donations and I would like to say thanks to everyone who has made a donation so far, for their support. Every pound counts, so even if you are not able to make a large donation a couple of pounds will be appreciated just as much. It is all about GIVING! We are giving our time and effort to complete the ride and all we ask is that you give a donation no matter how large or small to support us and the Dorset Kidney Fund. Please go to www.justgiving.com/revproteamride and support us and help to make the fundraising the easiest and not the most difficult part of the whole event. We are all training for our LEJOG as often as possible. One of the main problems that we have is not being able to go out and train all together due to conflicting shift patterns. I have been building up a base fitness by cycling to work each day and then going out in the evenings for an additional 20 mile dash. This week I have had some 0400hrs starting times at work and so have been leaving home at 0325 in the mornings-this is a great time for a cycle ride-cool air and not a car on the road, perhaps we should cycle LEJOG during the nights !!! Gareth has been out doing some 10 mile runs as part of his training programme so at least if his bike packs up on the trip he will be able to run to John o'Groats !! 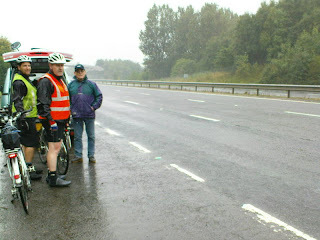 John has been out each day doing a 25 mile circuit and during one of these circuits he was forced off the road by a car. It happened on a roundabout and the car cut John up forcing him in towards the curb. Johns pedal caught the edge of the curb, his front wheel turned inwards and John was launched skywards and over the handlebars. On landing Johns head made contact with the curb stone and John reckons that if he had not been wearing a helmet he would now be in hospital or worse! John sustained a bad graze on his forehead and was badly shaken up. The driver of the car either did not see what he had done or even worse saw what he had caused and decided not to stop. Lucky for John another driver did stop and gave John some help. 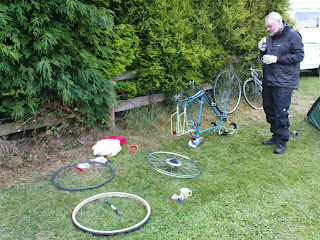 John's bike was not badly damaged but one of his bar ends was broken off. have been out on his bike. John is not a cyclist and it is only because John believes strongly in the charity that we are doing the ride to support, that he is out each day training hard on his bike. To cycle from Land's End to John o'Groats consists of more than the 9 days that we intend completing the distance in. It's all the hours of training required in order to achieve it. It's the crash that Gareth and I had on the Isle of Wight whilst training and the broken ribs that I sustained and the bad grazes to our legs and arms that we both collected- and it is the accident described above that could have had a far worse outcome for John than it did. Please support us by going to www.justgiving.com/revproteamride and read about the charity that we are riding to support and then make a donation on line. LEJOG Cycle Ride in September. Regular readers of this blog will be aware that in September I will be cycling from Land's End to John O'Groats. I am doing this ride with three of the guys that I work with and we are intending to complete an average of 100 miles plus a day for nine days in order to raise money for the Dorset Kidney Unit based at Dorchester Hospital. John Donoghue who is one of the team doing the ride gave a kidney to his daughter about 18 months ago and the care they received has inspired us to complete this ride and raise money for the unit as a way of saying thankyou. You could be one of the first to sponsor us by clicking on this link now! We will set out from Land's End on the 9th September and we will all be cycling the entire route (no relays here). The average age of our team is 52 years with two of us over sixty. For the past nine months we have all been training hard and for the next few weeks leading up to the start date the training will be stepped up a notch. During the trip I will be posting updates of our progress on this blog so you will be able to see some of the pain that we will be going through!! I realise that these days there are constant demands for our spare cash but this is a very worthwhile charity- one that I feel is worth cycling ONE THOUSAND MILES to support. I hope that you feel the same. Please send on this link to all your friends, family and contacts in order to make all the pain that the team has coming their way in September worthwhile. Keep logging on to this blog to follow the progress during the rest of our training and also during the ride itself . Tomorrow I was intending to set out on a three day cyclepacking trip from Paddington along the towpath of the Grand Union Canal to Birmingham a distance of about 140 miles. Due to the recent death of my Father I feel that I am needed at home for now and have had to pull out from this ride. I was going to complete this ride with Howard Kelly who I understand will still be doing the route on his new Dawes bike. I did walk this route about five years ago and I enjoyed the route very much. There is always something happening along the banks of a canal, lots of wildlife as well as people out on their boats or fishing etc. Early in the morning there is a tranquility about the canal that always seems rather special particularly when you remember that it passes right next to some very busy urban areas. If you have never walked the length of a canal give it a try. It's easy walking compared to some of the 'wild' places that I like to backpack in but still enjoyable in it's own way. As an added bonus you will always find plenty of convenient pubs right on the canal bank-not that I would use them of course !! Dorset Boundary Cyclepacking / bike in porch. Labels: Fullsize folding bike in Duolite porch. Further to the rather swift end to my Dorset Boundary cycle trip I can happily report that both Colin and Peter finished as planned. Peter managed to obtain some brake blocks for his bike although the shop in Bridport only had one set in stock that fitted. Due to the steel rims that Peter was riding on combined with the wet weather, he was forced on at least one occasion to slow up by aiming for the nearside hedge/ditch. Lucky that he did not hurt himself!! On the last night they camped at the Moreton C&CC site moving on from there on the last day by way of the Purbeck Hills and then the chain ferry across to Studland and back to Bournemouth. Peter did say that he enjoyed the last two days the most, as the roads were not so enclosed as at the start of the route and the views were better. Also the gradients although steep, were found to be easier. As I have not completed this route yet I do intend to go back in August and complete it in three days as part of my LEJOG training. The Tent: Wild Country Duolite Tourer. I like this tent! Although not as light as my usual mobile shelter, the Hilleberg Akto, it is as described 'great for cycle touring'. It is an easy tent to erect taking only a few minutes longer than the Akto and once inside you have lots of room. It has a huge porch which according to Terra Nova the manufacturers, is 'ideal for storing bikes.' Now I do question this. By bikes do they mean childrens bikes? Yes my fullsize folder was stored in the porch without any problem but that's a folder- I do question whether you would fit a normal tourer in the porch without compromising your own access to the tent. I think that I could get my new tourer in the porch if I dropped the front wheel first and if I am lucky I might even manage without removing the front wheel ,but as for bikes-plural-NEVER! But this is the only black spot on what I think is a very good tent. I liked the quirky shape with it's exterior pole system on which you hang the fly and inner. The tent is very stable in windy conditions hardly moving at all and in all the rain that we experienced not a drop entered any part of the porch or main tent area. The Duolite is as it's name suggests a two man tent. I am using it as a one man tent and for one person the space inside feels vast. There is enough room in the main tent for two campers but if they were both cyclists I think that one of the bikes would have to be chained to a fence outside the tent. When I do my Boundary trip re-run in August I intend using my new touring cycle and I will report back on how I get on fitting it in the porch. I had only obtained this a few days before the trip. It comes with a 'Get you Started' quick reference guide consisting of ten pages,the main instructions are supplied on a computer disc. I did look at the disc before I set off but once on the trip I could not remember some of the important items. This is the problem with instructions on disc which seems to be more and more the norm with electronics- a mistake I feel! However using the 605 with what I could remember and what I have learned from the disc since my return I can state that the Garmin is an awesome piece of kit. You can configure the readouts to suit yourself. All the usual things are there such as speed-average speed-time-time of day etc etc. But you also can add in things like elevation-calories used-pace-gradient-distance to destination and ETA at destination etc....... In fact there is so much information that you can access that you get two pages on the computer on which to display it-just a flick of a button takes you between them. Another push of the button takes you to the map page which also gives you turn by turn instructions for your route. Yes, you can read the screen in bright sunlight with no problems and for night use it has a backlight. When you get home you can download all the information regarding your ride to your computer. You can see a track of the route that you rode as well as all the information on speed-average-pace etc...It is brilliant and I have really enjoyed learning how to use it and seeing all the information concerning the rides I have made displayed on my home computer. No need any more to keep my ride history in a little log book- it's now all done for me. I obtained the Garmin with the European road mapping package which seems pretty good. Dave Topley who had the 705 version with the offroad mapping told me that he wished that he had gone for the road mapping as he has not found the offroad mapping to be that good. If you are in to cycle touring and like to do the odd sportive and cycle training then the Garmin 605 with the European road mapping package seems to tick all the right boxes and more. Expensive but worth it ! First thing this morning I received a phone call from Anne informing me that my Father was in the Q A hospital at Cosham and was very ill and not expected to survive- I was required there as soon as possible! 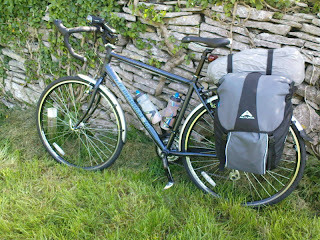 We all packed up our gear as fast as we could and cycled to Bridport. I went to the taxi office to get a taxi (bike in the rear) and said goodbye to Colin & Peter. Peter was going to pay a visit to the bike shop for badly needed brake blocks and other repairs and as far as I know,bike permitting, the two guys were going to complete the ride that we had started together. When things have settled family wise I will write up the review on the trip and report on the Garmin 605 and the Duolite Tourer tent. Postscript: My Father died- but I got to the hospital in time! Today we awoke to the sound of heavy rain on the tents. It had been raining almost all night, or so i am told, as i slept like a log. Dave Topley set out at about 08.00 hrs as if had to head back home ready for work on monday. Peter had to do some work on his bike- sort out his brakes and repair two punctures- one back and one front, that had appeared overnight. Due to this and the rain we did not get away till 12.30hrs. By this time the rain had stopped. We managed to avoid the rain for most of the afternoon except for one very heavy shower whilst we were having lunch in the churchyard in the village of Evershot. Peter continued to have problems with his bike all day. Brakes(none at the front) broken spoke-saddle position etc etc. In Evershot a small childs bike was outside a house with a for sale sign on it. I am sure Peter considered the purchase! We are now camping at a small site at a place called Slave Cross. 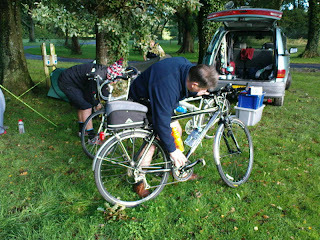 Todays picture shows Peter working on his bike before we set out today. Today set off at 1015hrs and headed to Shaftesbury. Plenty of hills, plenty of effort! When we got there the town was packed-some sort of summer Fete. We stopped for a break, admire the view and look at the bad weather coming our way! We set off again and stopped for lunch under a tree on a small village green. 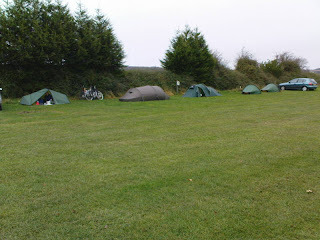 We decided not to visit Sherborne but get to the campsite and put the tents up before the bad weather hit us. Our timing could not have been better, as soon as the tents were pitched the rain came down. This evening has been spent at the Rose and Crown in the village of Longburton. The weather forecast is not good! Well i am now in my tent and wondering what the overnight weather will bring. We have heard that we could have gales and torrential rain. Today though has been great, nice and sunny although it did start to rain when we arrived at the campsite here at Sixpenny Handley. Nice easy distance today-only 32 miles according to the Garmin which is being recharged as i am posting this entry. Peter, Colin and i did the ride today fitting in a number of stops and we were joined at the campsite by David. Three of us ate down the pub tonight and in the morning we plan to have a cooked breakfast at the 'shed cafe'. The campsite owners do a breakfast so it will save us the effort. The picture today shows our tents pitched at the site-my wild country is the third in the lineup. I will write a report on this upon my return. Tomorrow I am setting off on another jaunt. This time it is a cycle ride over five days keeping as close as possible to the Dorset County Boundary. Two or three other Backpackers Club members will either join me for all or part of the trip.Interestingly each days mileage on this is about half of what I will be doing on my LEJOG in September as is the number of days of this tour ie: five days instead of ten. The plan is to leave home tomorrow morning, camping at sites over four nights and arrive back here on the fifth day. As normal I will be testing some kit. I will be trying out a Wild Country Duolite Tourer. This is a tent that the blurb tells me is designed with the cycle tourer in mind. Apparently there is 'plenty of space in the porch for storing bikes'. Well we shall see how good it is. Chris Townsend tested the Sololite version in TGO magazine and gave a good report on it. I will also be trying out a Garmin Edge 605 GPS/Mapping/Cycle computer. This should be a tip top item of kit as the 705 version is being used by the Slipstream Team in this years Tour de France. I am really looking forward to trying this out, powered of course by my continued use of the FreeLoader solar panel and hub. As normal I will make postings to my blog,mobile signal permitting. Well I managed to pack up the tent without it raining. Everything was packed into the car and not a drop of rain in sight. We enjoyed the Cotswolds and I even think that Anne quite enjoyed the camping. We had some heavy rain and we had some very strong winds but we also had some very sunny weather during our stay. On the photographic side I got some good material for my 'Dark and Foreboding' project, so all in all the trip could be deemed a success. Will Anne go on another camping trip? Well, only time will tell but I feel that that I stand a good chance of a repeat trip along similar lines to this one next year. A day trip to Oxford by train was todays great adventure. What a great place this is for the cyclist. Bikes everywhere- here the bike is king- this is the way all towns will be in the not too distant future. This is a real bike spotters heaven, i must have seen almost every make and type of bike that there is. 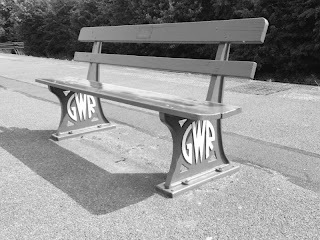 Now i realise that not everyone is a bike spotter so for you Train spotters out there of which I know a few follow this Blog on a regular basis I have posted a photo of a GWR bench. Nice! The Cotswolds-days two and three. I didnt post my Blog yesterday because I was to scared to let go of the tent. The wind was so strong that a lesser tent would have blown away. 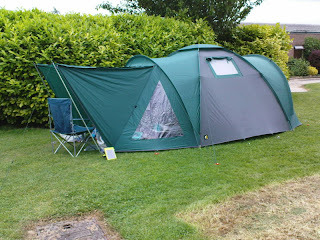 However my Relum Nissiros tent stood up to the gales rather well earning me points with Anne. This tent has only been used four times in the ten years that I have owned it as was proved by the time it took me to erect it. The first night as well as gales we had torrential rain. Not a drop entered the tent! More points for me. Today another camper came over to ask about the tent remarking what a good solid looking tent it was. All of this does wonders for me as Anne is starting to think that I know what I am doing! 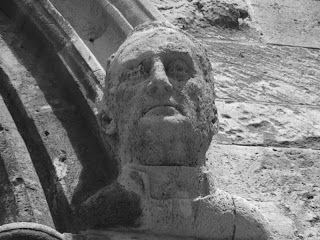 Anyway on the photographic side I am getting some really good material lots of stone heads and dark looking doorways. I even think that Anne is starting to enjoy this camping lark! Well we got here and no rain- well not until this evening. The only comment ANNE made was 'where is the on suite'? Oh dear the rain is coming down quite heavy now i could be in trouble here! Tomorrow morning I am heading to the Cotswolds for a six day camping trip. Nothing unusual in me going on a camping trip. What is unusual about this trip is the fact that the 'long suffering Anne' is coming with me. Yes she has said that she will be staying in a tent with me. The last time we went camping together was about five years ago. On that trip it rained when we put the tent up and also when we took the tent down. After that trip Anne said 'never again' !! Well I have managed to talk her into trying it once more. I have promised her first class weather and a first class camping and caravan club site to pitch on. Earlier today I saw the weather forecast for this weekend and it seems that I could have a PROBLEM. The forecast for the next few days does not look good. We will be staying in the biggest tent that I own. By my standards camping in a tent this size is almost NOT camping. It feels almost like luxury-almost five star comfort. Anne does not see it like that. She sees cold and damp mornings- insects- draughts-noisy campers etc etc........I will keep you posted as to how we get on. If we get on! 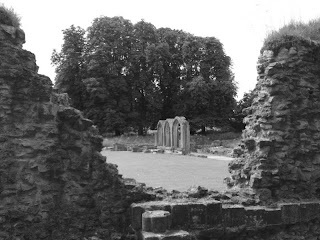 The trip does have a purpose- I am hoping to get some photographs for a project I am working on with the working title of 'Dark Foreboding'. Actually that's the feeling I have about this trip at the moment!! Well I have finally done it. After a lot of thought I have invested in a Brooks Saddle for my folding hybrid cycle. When I bought the bike it came with a unisex velo saddle.After the first few miles it became obvious that my saddle and I were going to have to part company. At any distance greater than a trip to the local shops the sit bones on my posterior ached like crazy. That saddle had to go, so off I went to the local cycle shop for something more comfortable. The saddle I purchased was a sports style which was narrower than the original saddle supplied and this seemed to do the trick- well I thought it did. It was certainly kinder to my sit bones (men need a narrower saddle than the girls) and on journeys up to about 50 miles it was fine. Where I found a problem though was on journeys exceeding this mileage. The problem seemed to be caused by the 'squidgy' material most modern saddles are made with. It looks comfortable but on longer distances the 'squidgy' material flattens out and stops giving your bottom full support. Now don't misunderstand me, most of my journeys are under 50 miles and it is only now and again when touring that I might exceed this distance. However with my LEJOG coming up in September with a proposed daily distance of 100 miles I needed to do something now in order to address the problem. 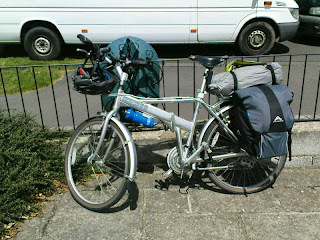 Years ago I had a Brooks saddle on a bike that I used for touring from one Youth Hostel to another. I was about 14 years old at the time but I always remember that my old saddle was so comfortable. Now a Brooks saddle doesn't 'look' comfortable. The model I have chosen is a Brooks Team Professional and it sports huge copper rivets that look as if they alone could do you serious and permanent damage. The saddle also needs breaking in (a bit like leather walking boots do.). But I must say that even though my new saddle is not broken in yet and won't be for many miles and in spite of it being rock hard it is surprisingly comfortable. I am also led to believe that the level of comfort improves over time and mileage. So it is a bit like pedaling towards a 'posterior comfort holy grail'. The further you pedal the better it becomes. Brooks list my saddle at a retail price of £86.59 but I managed to obtain one from http://www.sjscycles.com/ for £65.00. Apparently Brooks saddles are in short supply at the moment (wiggle are quoting mid September delivery) so if you want a specific model you might have to search around a bit. I will keep you all posted as to the ongoing comfort or otherwise of my new purchase and no doubt some reference to saddles will be made during our LEJOG in Sepember. Those of you that read my report back on the 26th May headed Cycling by Train will have seen my comments concerning the fact that so many cyclists these days seem to feel that they are above the law. I commented on those cyclists that jump red lights and ride on the pavement and generally ignore the rules of the road and the safety of other road users. Well now you can sign up to an online petition declaring that you will 'Stop at Red'.